"A will-of-the-wisp, the dream of a rich unplundered cemetery of the middle classes at El-‘Amarneh, full of choice vases and amulets, beckons to each successive explorer. Our excellent head-reyis Sulman, who had so successfully tracked the Sanam cemetery at Napata, was allowed a fling at it for two days at the beginning of the year with a chosen band of assistants, but nothing came of the attempt except finding a few bones in holes in the high desert and scoring the sand stretches east of the town by many new trenches. There are square miles of sand wastes levelled by wind and rain where a cemetery might lie without indications on the surface; on the other hand it is quite possible that no such cemetery ever existed. The less important people of Akhenaten may have been buried with earlier and later generations in the enormous cemetery of Tunah on the edge of the western desert… Supposing that there was an average of 30,000 inhabitants, the number of those who died during that time [the fifteen years of the city’s lifespan], great and small, might have been 6000. These might have filled a very large cemetery, but to judge by other cases in Egypt only a very small proportion were buried at all in such a way as to leave bones or other deposits to bear witness to their existence. What happened to the rest can only be conjectured; but until a second-class cemetery of the ‘Horizon of Aten’ can be found I would suggest that only one in a hundred bodies need be accounted for, so that the finding of sixty plundered or unplundered graves or skeletons might represent the above 6000. If this is correct, we need look no further than the rock tombs and the bones scattered in and about them for the cemetery of the ‘Horizon of Aten’. Not that explorers must relax their watchfulness for burials." The puzzle seems now to have been solved. It has come about through the desert GPS survey begun in 2001 and continued in subsequent years. First came the discovery of two cemeteries (clearly robbed) of what must be relatively poor graves on the flat desert not far from tomb no. 6 (of Panehsy), the southernmost of the North Tombs. The surface pottery is appropriate to the Amarna Period. In 2003 a third cemetery was discovered on the east side of a narrow wadi which runs back into the low escarpment behind tomb 25 of the South Tombs group. 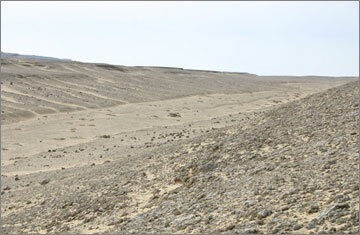 In 2004 two further cemeteries likely to be of the Amarna Period were located on the floor of another wadi which cuts through the cliffs where the North Tombs are located. The South Tombs cemetery lies approximately 650 metres to the south-east of the modern path which connects the rock tombs of the southern group (a map is given in JEA 89, 2003, 11, Fig. 1). To judge from the condition of the ground the cemetery has been robbed. Of the various cemeteries located it is the one that has the most varied material present on the surface, including late 18th Dynasty sherds, a few pieces of glass vessel and faience, and mud bricks. It has also been partly washed away by occasional floods that have swept down it and across the desert plain in front. The floods left behind a scatter of human bones along both the sandy floor of the wadi and the watercourses that cross the desert plain beyond.